Located at the gateway to the Snowdonia National Park and just outside the magnificent Medieval Town and Castle of Conwy, our cosy little cabins offer a romantic and relaxed getaway. 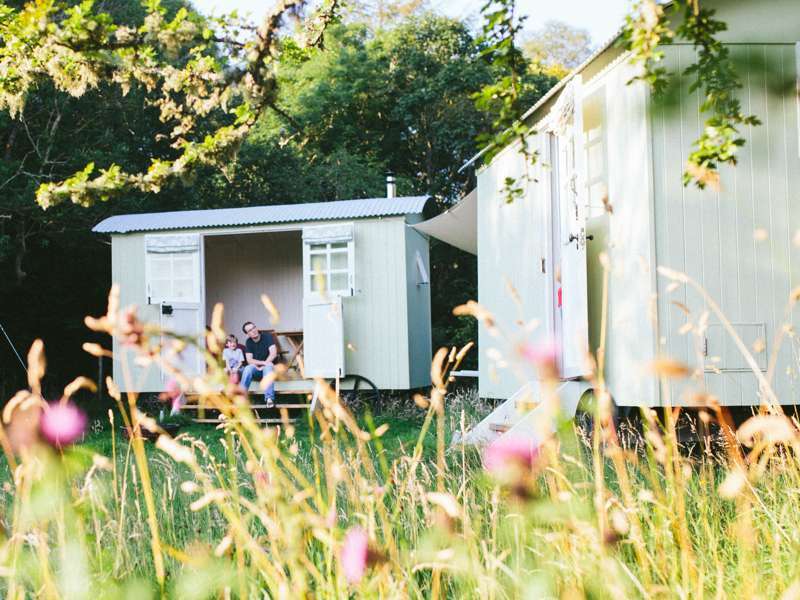 They nestle in 3 acres of naturally re-wilded fields and woodland in the stunning Conwy Valley. 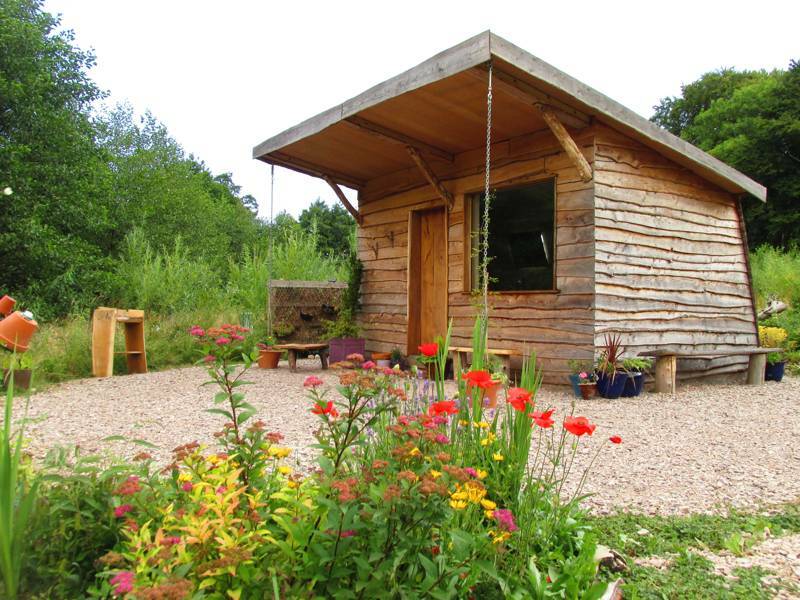 Share this magical site with our resident wild owls, red kites, otters and many song birds. 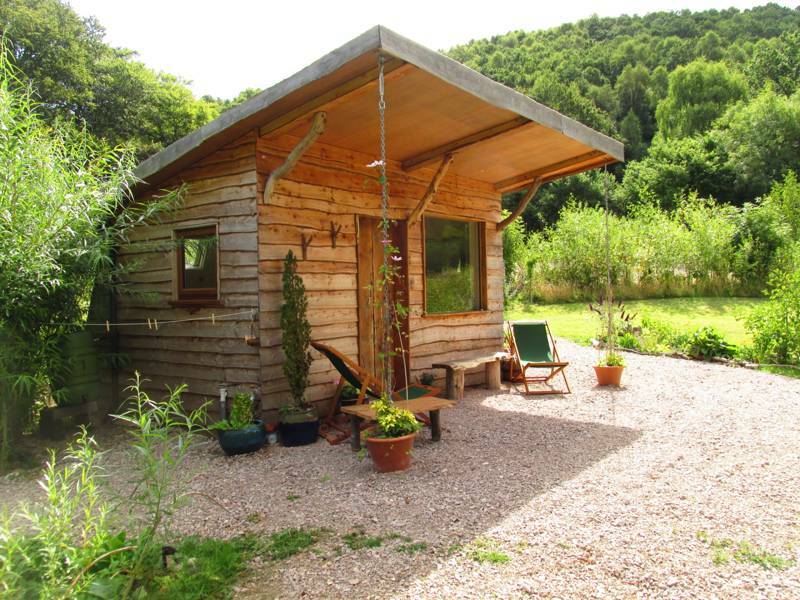 Our two eco cabins are made from locally sources wood and are highly insulated. Each includes a comfy double bed, kitchenette, electric fire, LED lights, electric sockets, USB charging sockets, folding chairs and a window table. Each cabin has its own green toilet adjacent to it and they share a lovely hot electric shower in a nearby shower cabin. Outside each cabin has its own fire pit, BBQ and deck chairs for a relaxing evening spent enjoying the stars! There is free on site car parking and a free Wi-Fi spot. For latest availability and best prices for The Cabins Conwy, please use the Date Search above. Each cabin has a double bed, with all bedding, linen and towels provided. Each cabin has its own kitchenette (with sink, double-ring hob, kettle, toaster, fridge with small freezer compartment and all the pots, pans and utensils you need), a dining table, 2 folding chairs, bedside cabinet, electric lights and sockets, LED lantern, tea lights, USB charging points and flame-effect electric fire. Outside, each has its own composting toilet cabin and a campfire and BBQ area. The 2 cabins share an electric shower. Car parking. Nature walks. Pick fruit and herbs from the garden around your cabin. Seating areas. No WiFi in the cabins but a code is provided for WiFi at David and Sue's office, 50m away. With Snowdonia National Park right on your doorstep, there's plenty of hiking, cycling, and general outdoors-ing to be done. You can walk directly from the site straight into the Carneddau Mountain range (Sue and David provide some suggested walks which take in stunning views and historical sites). It’s a 10-minute walk along the road to Conwy Water Gardens (01492 650063), with fishing onsite, a restaurant specialising in pancakes and picnic areas, while, for something really different, Surf Snowdonia (01492 353123), Europe's largest inland surf lagoon, is a 5-minute drive away. For most visitors here, however, the historic, walled town of Conwy is a must and an essential place to soak up local culture. The town is a 5-minute drive from The Cabins Conwy and has a magnificent medieval castle (01492 592358), built by Edward I during his conquest of Wales (1283–1289), and overlooking the mouth of the River Conwy. It’s paid entry (though well worth the fee) but you can walk the town walls for free, peeping into people’s gardens and enjoying the rooftop views as you go. Down at the quay you can watch the boats, have a pint and pop your head into Britain’s smallest house (01492 573965). Or drive across the bridge to visit the Victorian seaside resort of Llandudno (complete with pier and sweeping beach) and explore the Great Orme Country Park. David and Sue like to welcome guests with a taste of local food; usually a couple of delicious meat pies or cheeses (from their local award-winning butchers), home-made Welsh cakes, tea, coffee and a pint of milk. Vegetarian, vegan and coeliac options are also available. There are 2 award-winning, traditional pubs – The Ty Gwyn Coaching Inn (01690 710383) and The Groes Inn (01492 650545) – that serve food and are within easy walking distance. 5 minutes along the road is The Dutch Pancake House (01492 651063) and within a 5-minute drive is the Bodnant Welsh Food Centre (01492 651100), which sells a wide range of local food and beer and has its own restaurant. Medieval Conwy town is also a 5-minute drive and has a wide range of eateries and pubs, from fish and chips on the quay to a fancy meal out in Signatures Restaurant (01492 583513). The Albion (01492 582484) is a particularly good place to try the local beer, while Parisella's Ice Cream Parlour (01492 592 448) is the perfect afternoon treat. From Chester (A55): Come off at Junction 18 and follow the signs to Conwy. Go across Conwy Bridge and take the first left at the mini roundabout to Gyffin. Continue along Llanrwst Road (B5106) until you see The Groes Inn on the right and take the first turning on the right to Rowen/Conwy Water Gardens. Continue for 700m and The Cabins Conwy car park (purple gates) is just past the church in the trees on the right. From Llangollen (A5): Come off at Betws y Coed, taking the A470 north towards Conwy. Continue along until Tal y Cafn and, at the cross roads, turn left (B5279) across the railway and the bridge towards Ty'n y Groes. At the Red Lion cross roads, turn right towards Conwy (B5106) and continue until just before The Groes Inn. There, take the turning on the left to Rowen/Conwy Water Gardens. Continue for 700m and The Cabins Conwy car park (purple gates) is just past the church in the trees on the right. The nearest railway station is at Conwy or Llandudno Junction (5 minutes further). Then take the Number 19 bus to the bus stop at The Groes Inn. From there it's a 5-minute walk to The Cabins Conwy – take the Rowen turning just after the Inn and The Cabins Conwy are along the road on the right (purple gates). A pair of insulated cabins (each sleeping 2 in a double bed; additional single camp bed also available).